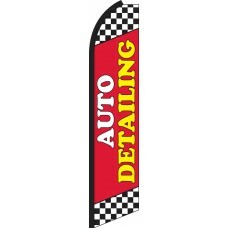 Our Car Wash and Auto Detailing Swooper Feather Flags are aesthetically appealing and succinct. They are designed to grab the attention of prospective customers as they drive past them. This makes them ideal for any business seeking to promote the services that they offer. Each one has been designed by our team of experts to maximize their advertisement potential to your customers. 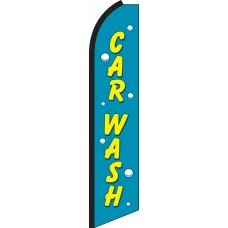 One of the problems that car washes have, is generating awareness of the services that they offer. Yes, your customers may know that you wash cars, but do they know about the premium detailing service you offer? The best solution to this problem is to use our Swooper Feather Flags, to promote and highlight everything that you do. They are exceptional at both attracting new customers and reminding existing customers of precisely what you do. They are also an excellent way to decorate your location: we are always told not to judge a book by its cover, however, this doesn't apply to businesses. The way you look really matters and the more professional, colorful, and appealing the property looks, the more customers you will attract. Don't fall into the trap of looking boring, buy our cost effective feather flag sets and see how much difference they will make to your business.